Dig, Grow, Compost, Blog: Flinging in D.C. 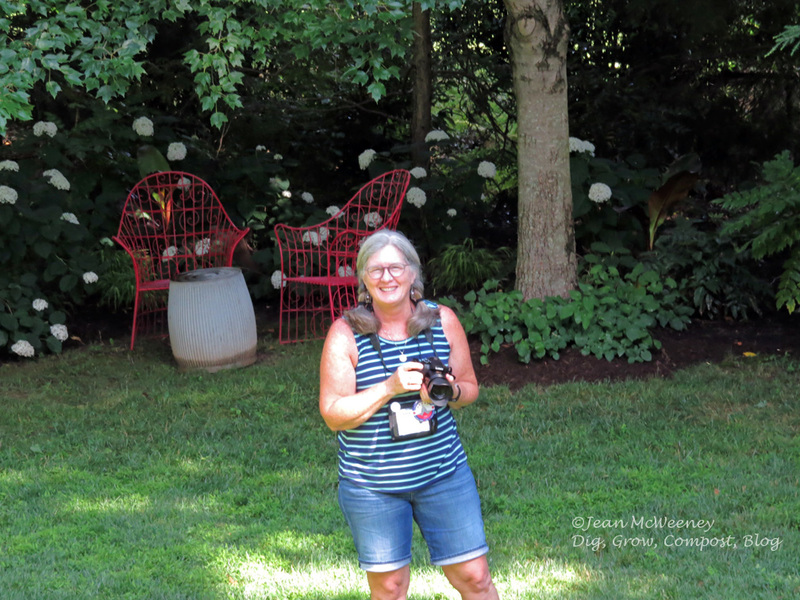 In late June I once again had the pleasure of attending another Garden Bloggers Fling, this time in the Washington DC area. Wow, we saw a lot of extraordinary gardens, both public and private. This time around I decided not to spend so much time behind the camera and just enjoy the gardens. So my trove of pics from this trip is a little skimpy! I finally went through my photos intending to pick out one garden I liked the most and do a blog post on that. But... just when I thought I had settled on one garden I'd find pics of another garden I really liked. Eventually I settled on the Public's garden - the gardens around the Smithsonian. 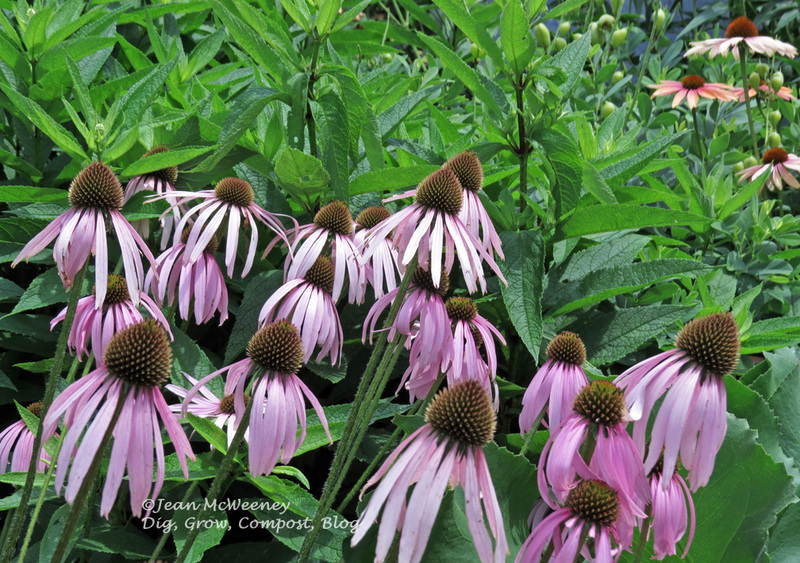 Sorry, I'm not sure what these are but most likely they're one of the newer Echinacea varieties. Yes, I know that anyone who's in Washington can see these gardens anytime and so you may be disappointed I chose them but really, they were quite extraordinary. 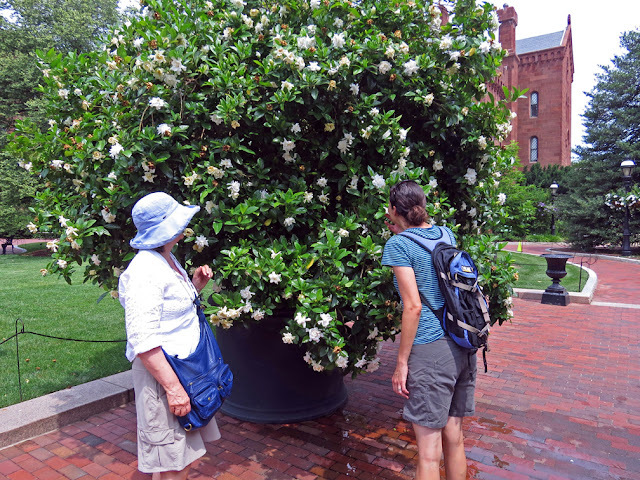 Take this giant gardenia, for example. One gigantic gardenia in a pot! Here Gail and Andrea take a whiff. Seriously, this potted gardenia was huge! It was in the Enid A. Haupt garden right next to a little sitting area. Perfect place to sit and inhale that sweet Southern perfume. I imagine it's quite a task to bring that plant in for the winter. 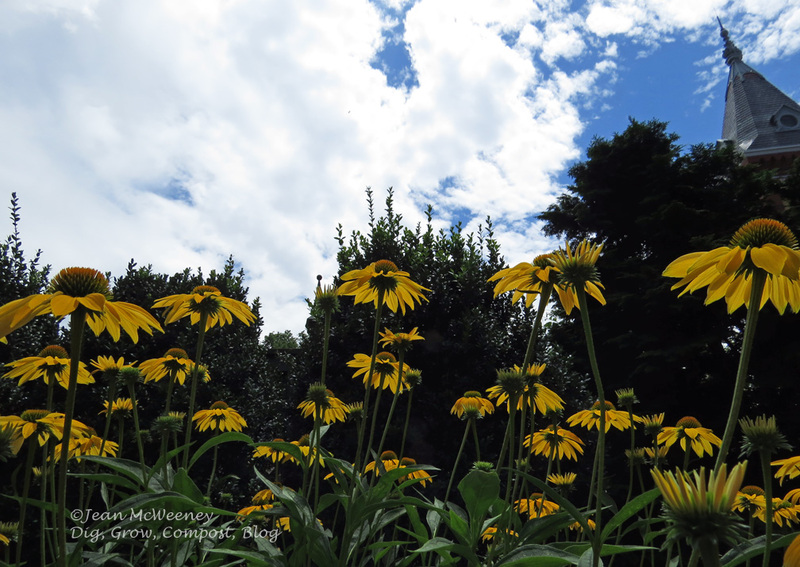 The Haupt garden had a huge number of coneflowers. All the newest varieties and also the tried and true species. 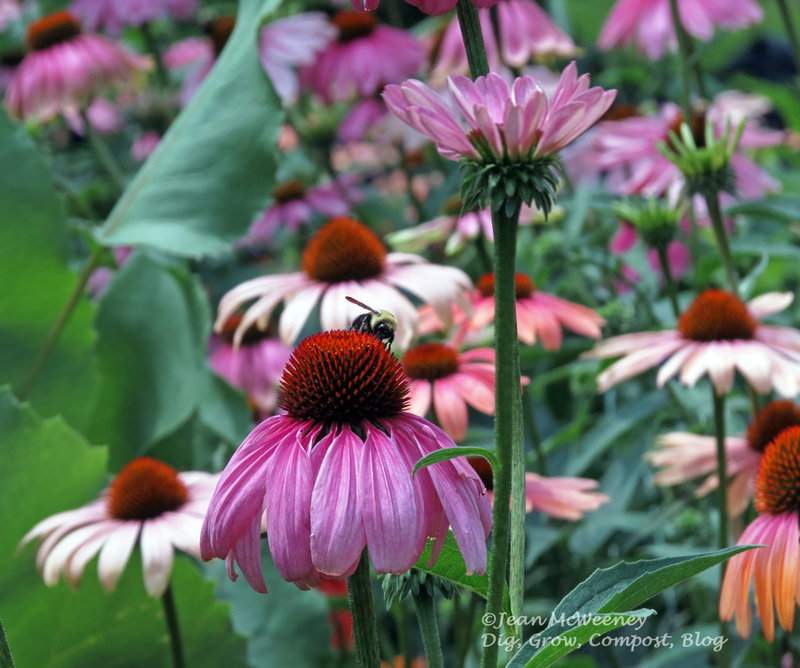 It was a pollinator haven. Might be Echinacea pallida. Anyone know for certain? WANT!! Looks like blue chalk sticks (Senecio mandraliscae) in the background, some kind of echeveria in the middle, and silver ponyfoot (Dichondra argentea) as the spiller. 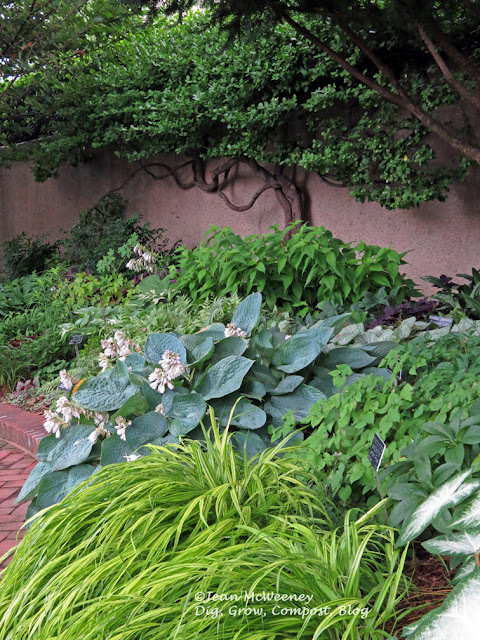 Most of these gardens are in raised beds that give you a great up-close view of the plants. As you round the corner into the garden it becomes intimate and scaled to people. That doesn't mean it's wimpy - far from it! 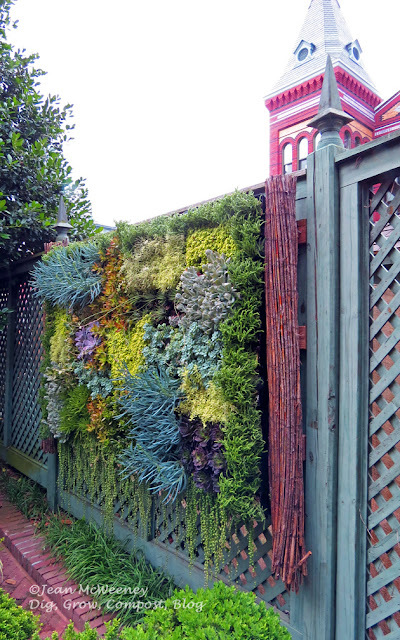 A wall of succulents. This looks so good I could eat it! There were a lot of really interesting plants in beautiful combinations. And lots of really interesting made objects, like this succulent wall. 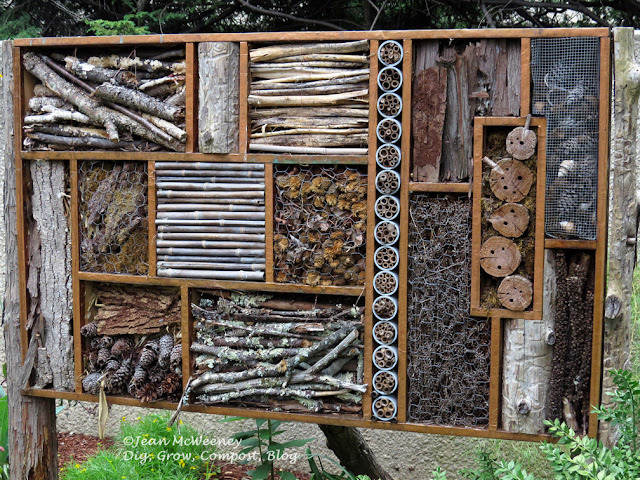 And like this pollinator hotel that was made mostly with found objects. It's almost like a sculpture, isn't it? This shade garden caught my eye because of the sculptural little tree along the wall. The Ripley garden is relatively small but big on impact so I urge you to visit it if you're ever in the capitol. 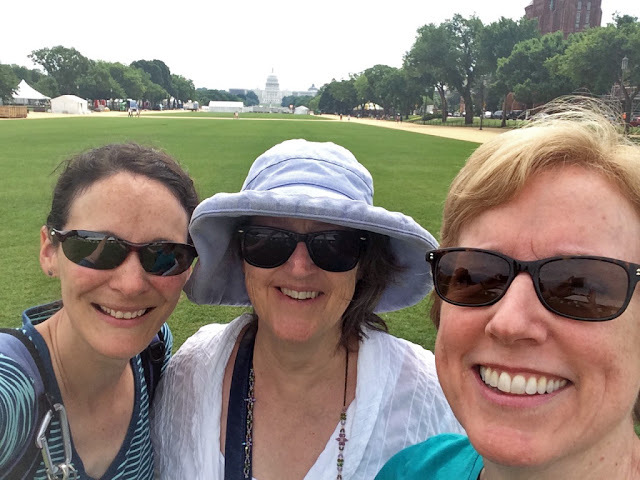 The best part of Flings is reconnecting with old friends and meeting new ones. Here are just a few of the Flingers I was happy to see this year. Andrea, on the left, was our guide around the Mall. She's temporarily in DC but moving back to Texas soon. Gail, of Clay and Limestone, and I got the grand tour from Andrea! 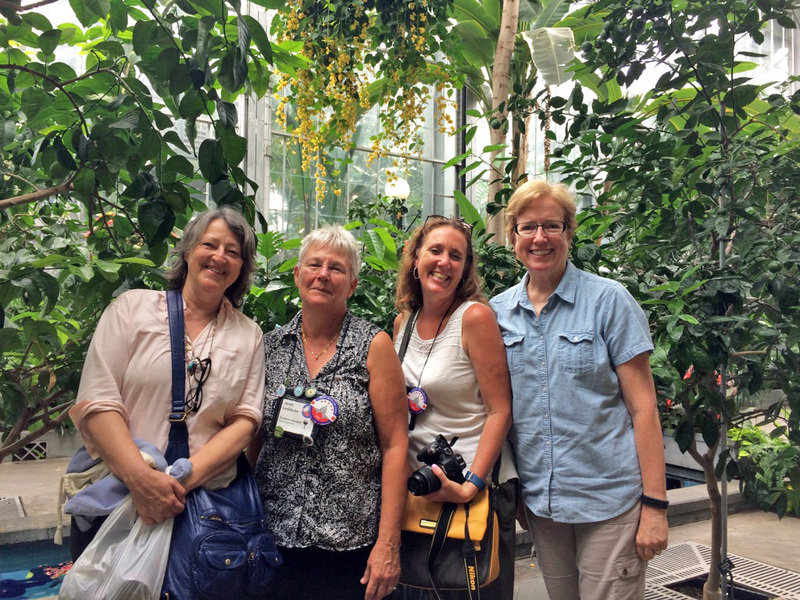 Gail, Janet, Karen, and I sweating it out in the U.S. Botanic Garden. If you're a garden blogger, you need to come next year - it's in Austin to celebrate its 10th anniversary, woot!! Oh, wow, I missed that succulent wall entirely! It's beautiful. It was lovely to see you again, Jean. Cheers till next year! A lovely post, Jean! Thanks. Great shots, especially of that succulent planter and wall, and of you and blogger friends. It was fun to Fling with you again, and I look forward to seeing you here in Austin next May -- if not before! 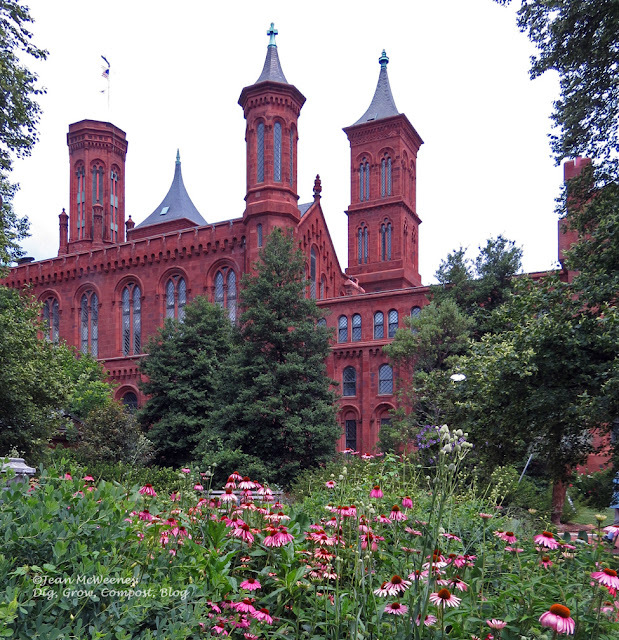 The Smithsonian gardens were among my favorites too. There was so much inspiration and creativity to be found. Looking forward to flinging with you in Austin next year!! 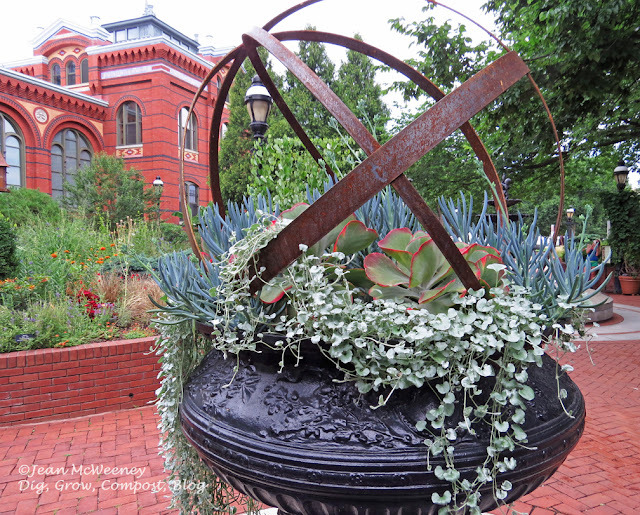 Wow--that succulent wall...and the pollinator hotel...and the metal garden ball with plantings! Very impressive. I wish I'd been able to make it this year--it looks like it was a wonderful Fling. Thanks for sharing highlights!